22 year old Stefanie Woods, also known as the “Cookie Monster” was sentenced to 15 days in jail and additional 50 hours of community service for violating her probation. Woods was on probation for committing an armed robbery and kidnapping back in 2009. 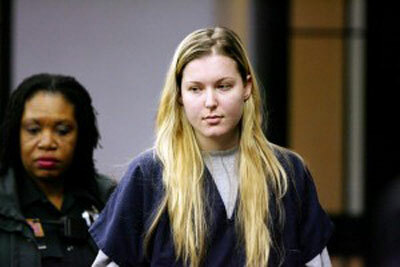 On September 30, 2009, Stefanie Woods was behind the wheel, giving a ride to a drug dealer named Quincy Grant, when her boyfriend – Alexander Rill of Palm Beach – jumped into the back seat with another man and robbed Grant at gunpoint. They stole methadone and Xanax tablets from him. Because of that incident, Woods was placed on house arrest and probation after pleading guilty. Before the robbery, Woods was arrested at a Denny’s for a dine-and-dash over $25 of food. And before that, she did something so ridiculous that it earned her the moniker Cookie Monster. Sometimes there are no words. We wonder what happened to the other girl in the incident, who also expressed a lack of any moral center whatsoever. “The law of karma is built into the fabric of the un2#2rse&v8ei1;though unprovable, this makes eminent sense almost to the point of being axiomatic.its physical equivalent may be stated as the principle of conservation of energy, whose violation has never been observed, maybe the most profound of all physical laws.one may argue that scales of justice (karma) are its psychic representation.if this principle is seen as antisemitic, tough. Never get between a drug dealer and his Xanax pills. It will not end well.